Right now, there are a few things that have taken the beauty world by storm. Contouring products, Brow products and Beauty Blenders. 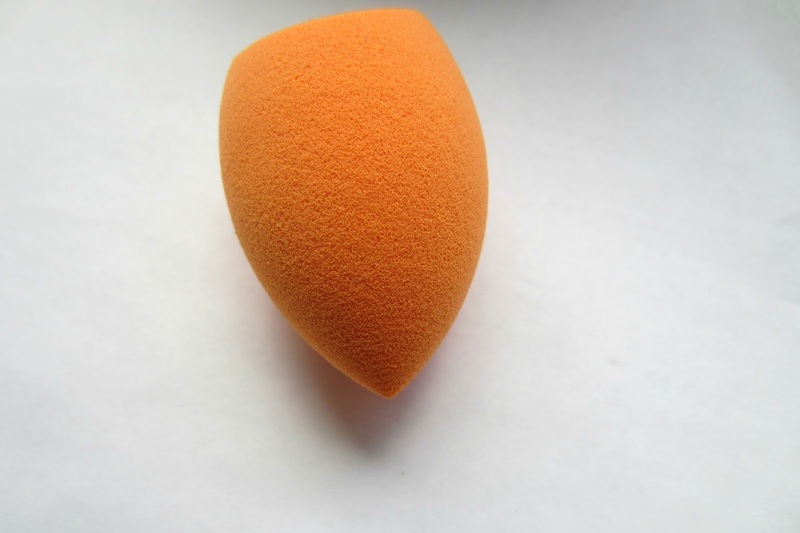 I have been very curious about the beauty blender because many people swear by it and its kinda pricey- about $20 for one and you're supposed to replace it every 3 months. I love using my brushes so I was quite skeptical about using a pricey sponge that needs to replaced frequently compared to a brush. Real Techniques released the Real Techniques Complexion Sponge sponge which is supposed to be a dupe for the real Beauty Blender at a fraction of the price. It retails for $5.99 and its available at most drugstores and other stores where Real Techniques is sold. This sponge is latex free so its ideal for those who have an allergy to latex. 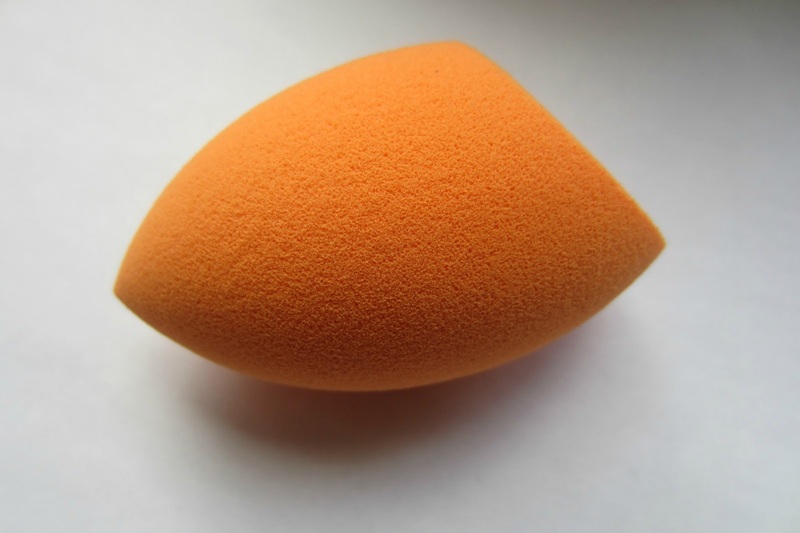 This sponge is a bit different from the Beauty Blender as the Beauty Blender is a tear drop shape and the RT sponge has a tear drop shape on one side of the sponge and the other side has a slanted flat edge for the contours of the eyes and nose. The tear drop side has a pointed tip to cover blemishes and imperfections and blend concealer in your inner corners of the eye. I have not tried the Beauty Blender.... yet but I want to soon. I have tried a ton of beauty blender dupes- some I like and some I don't like. I had high hopes for this sponge because of all of the hype. For starters, I do not like that the sponge does not have a lot of bounce to it. I like to stipple my foundation and concealer on and I feel like it doesn't have much bounce to it so blending is a chore. 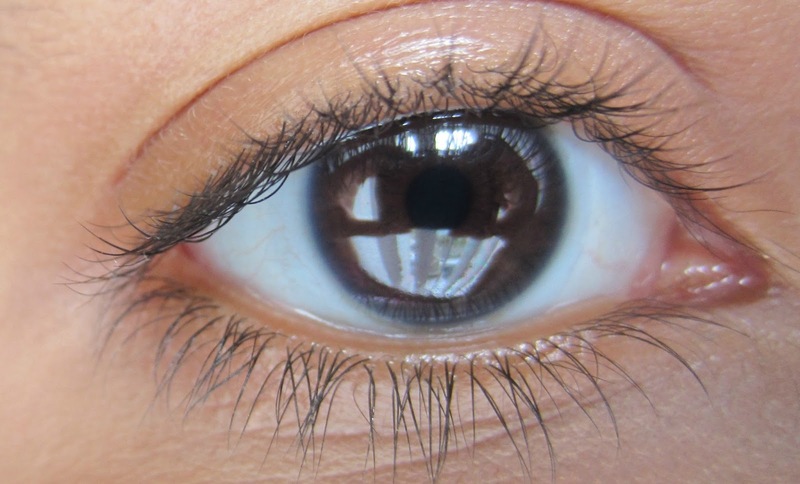 I also find that the pointed end is not pointed enough to blend concealer in the inner corners of my undereyes. I think that the flat end of the sponge may be nice for those who like to contour with cream products. Overall, this sponge did not wow me- it works fine. 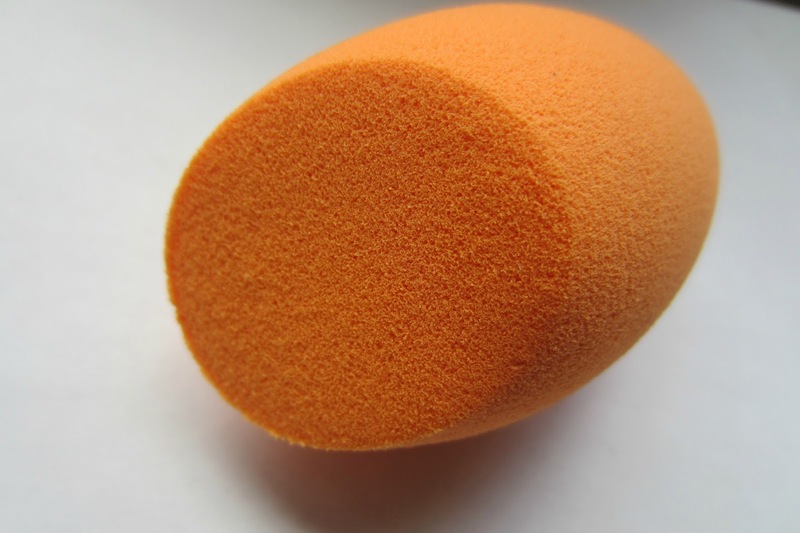 There are faux beauty blenders that I have purchased on ebay for less than this sponge that work well. I am a hairy young woman. There, I said it. I know I'm not the only one and all of us women understand the struggle of hair removal. We want to be bare especially for the summer because of bikini and sundress season so we go to great lengths to wax, shave, thread, tweeze- you know the deal. All of which is super painful. For the past year I have added epilating to my hair removal regime. This is the question that I receive without fail whenever I tell someone that I epilate. Essentially, it is a machine that looks like an electric shaver. 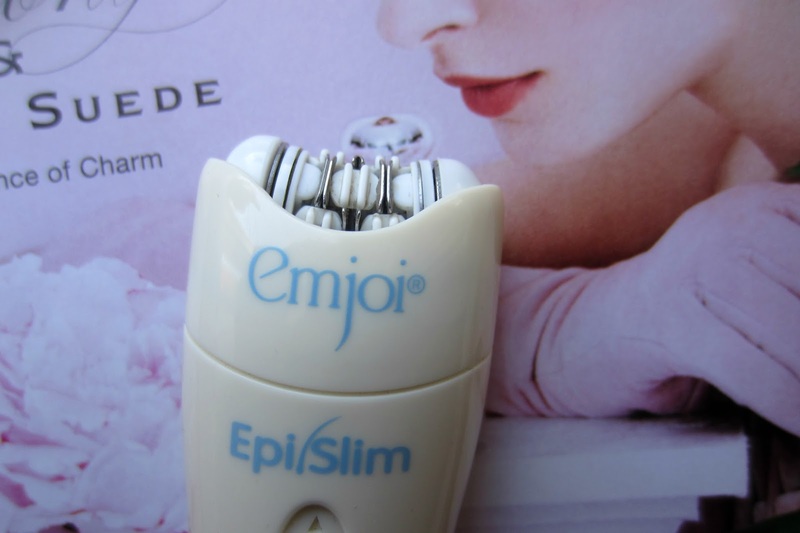 Instead of razors there are rows of little tweezers that when you glide it over the skin where you want to remove hair will pluck out the hairs.Cue disgusted look. Like waxing, it is painful especially when you first do it but after that it is very bearable. You'll get used to it. Don't forget that pain is beauty. I only epilate my underarms because I find that I get better results- it lasts longer and I don't have to worry about having dark underarms due to shaving. I prefer epilating my underarms instead of waxing because I don't have to spend money on getting it waxed, purchasing wax if I were to do it myself and spending a lot of time waxing myself. Honestly, I'm not a big fan of waxing my underarms. 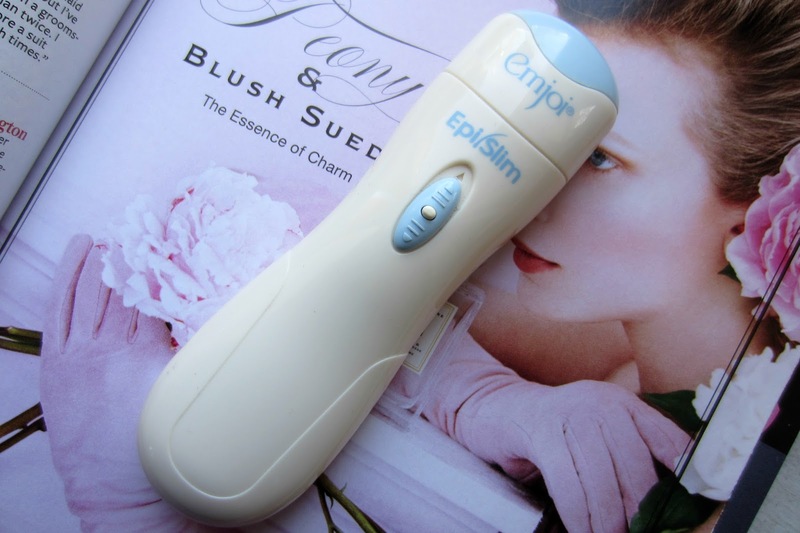 I have been using my Emjoi Epislim for about 2 years and I purchased it on ebay for approximately $13. I purchased this little guy because I was new to epilating and I wanted to try it out. It is very simple to use- you just have to slide the button up to turn it on and it functions on 2 AA batteries. The epislim has rows that have 2 tweezers and rows where there is only 1 tweezer. I find that it works well and gets the job done. It's definitely good for the price as a lot of other machines retail for double or triple the price of this machine. The trick to having a good experience when epilating is to select a epilating machine that has more rows with more tweezers. This will result in the hair being removed faster. Overall, I prefer epilating because its mess free and less costly compared to getting waxed regularly. What is your preferred hair removal method? It has been AGES since I lasted uploaded a nail post. I have been so busy that I haven't had time to do my nails- I actually have gone without wearing any nail polish for a few weeks and to be honest I have not felt inspired. I wanted to share with you this very simple nail look that I feel is perfect for the season because of the bright colors. It kinda reminds me of the beach for some odd reason like a beach ball or something. All I did was apply a base coat, paint my nails white and let them dry. Then I placed a piece of tape on the bottom half on my nail at a slight angle. 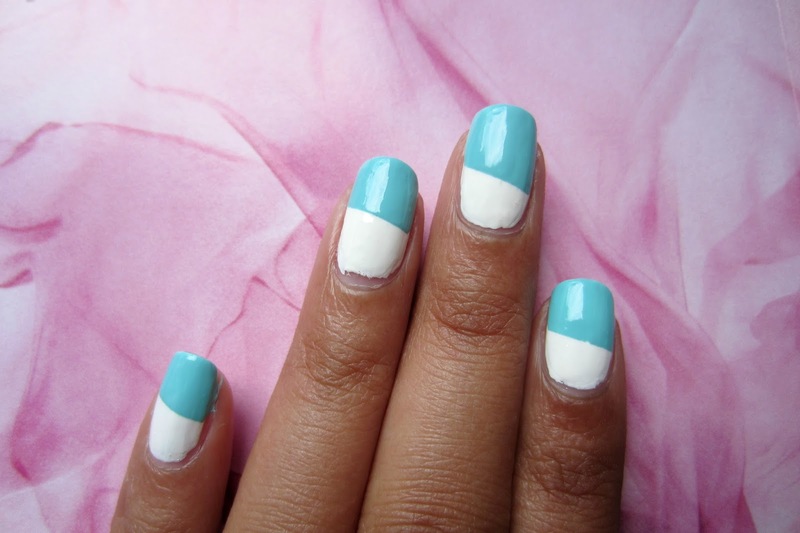 I painted the top part of my nail with a mint blue polish and then I applied my favorite top coat. Fin! Milani Fast Dry Nail Lacquer "White on the Spot"
Wet n Wild Megalast "I Need A Refresh-Mint"
This is a quick and simple FOTD using two new products that I hauled last week: Nicka K HD Concealer (which I love) and Angel Lashes in #73. I was very excited to give these products a try and share them on the blog. 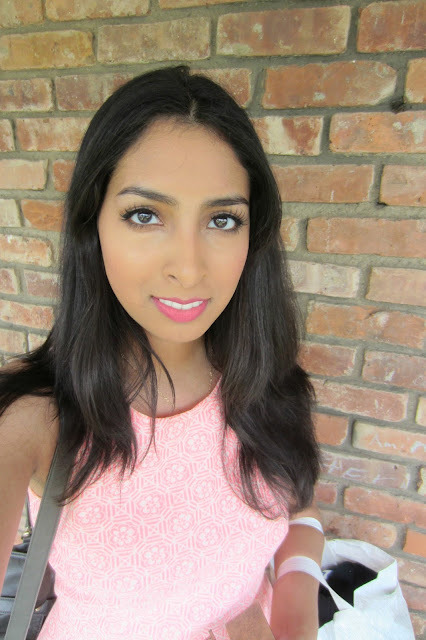 I went a simple winged eyeliner and a matte pink lippie because I felt like the lashes were the star of the show. I like these lashes but I feel like they are a little too long for my eyes. A $1.99 concealer that promises to instantly cover imperfections? Count me in. 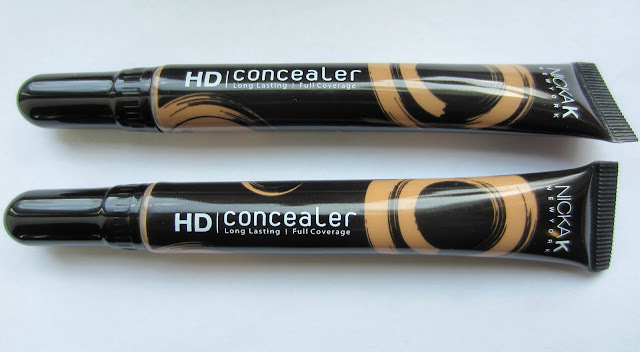 I saw this concealer in a youtube haul and the youtuber said she liked this and that its a dupe of the LA Girl HD Concealer which is also a dupe of MAC Prolongwear concealer. I've tried a few Nicka K products before but I have never tried any of their face products. I was intrigued by this concealer's claims. 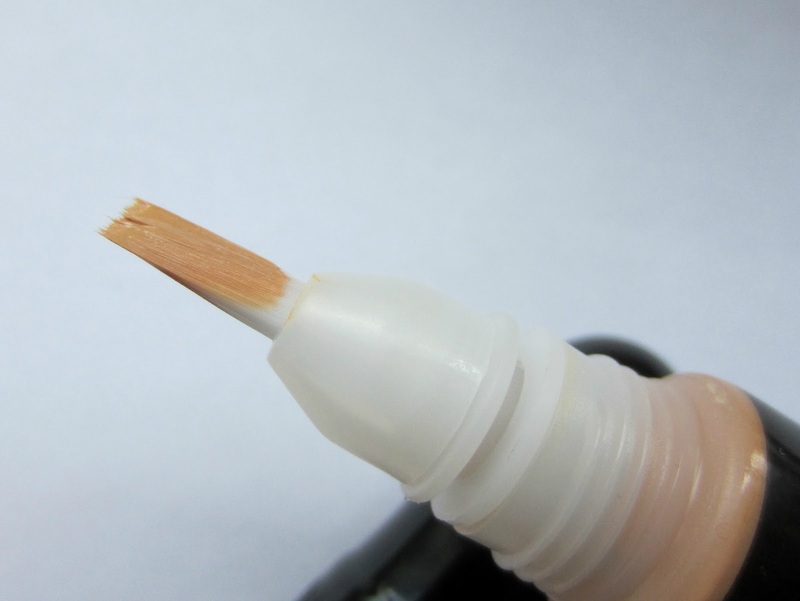 This concealer has a brush tip applicator just like the LA Girl Pro HD Concealer. I'm not a huge fan of brush tip applicators because they can get bacteria since its in constant contact with the skin. 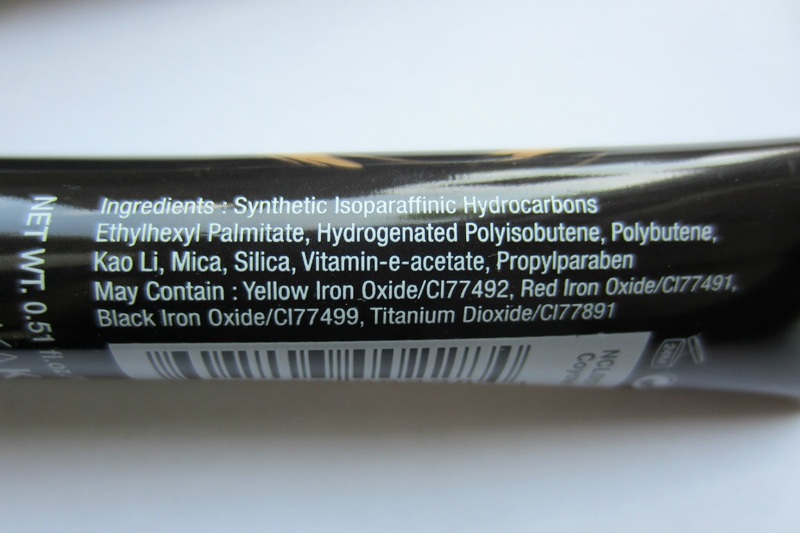 The packaging is long and slim and it brings 0.51 fl oz of product. 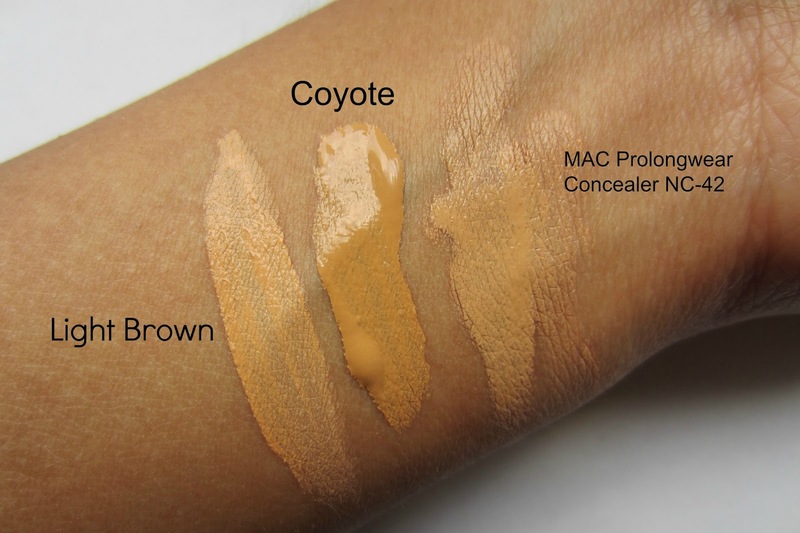 As the swatches online were awful and somewhat misleading since most of the shades looked the same to me I ended up settling for Coyote and Light Brown in the hopes that one of those two shades would match me. For reference, I am NC 42 in Mac and I like NC42 concealers as I am not a fan of the "three shades lighter gotta highlight" concealer club. I like concealers that cover up my dark red under eye circles and that don't settle into fine lines. I find that Light Brown is a great match for NC 42. Consistency-wise it is very similar to LA Girl Pro HD Concealer in that it is very creamy and it blends well. This concealer is medium to full coverage and it does not settle into the fine lines under my eyes. I do notice that this concealer does somewhat fade during the day- around 10 hours of wear but it is not very noticeable. Setting it with powder helps keep the concealer in place. Here is a pic with the concealer on. It definitely covers my undereyes but I feel as though it does not brighten my undereyes. I understand why it doesn't since its basically the same color as my foundation but I feel like the Mac concealer does give a slight brightening effect. Anyway, I really do like this concealer; this concealer does its job well and its so inexpensive. 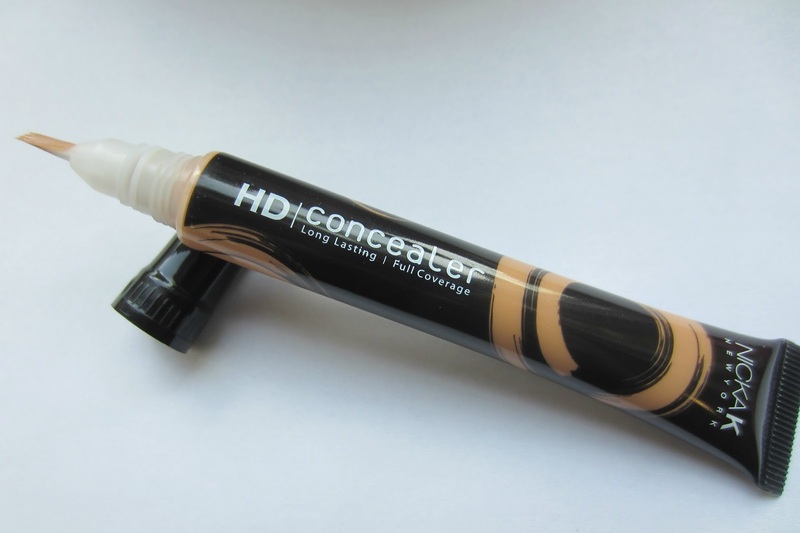 If I desire more color correcting for my undereyes I'll just resort to using a corrector underneath this concealer. I definitely recommend this concealer. Lately, I have been collecting a few bits and pieces from shopping. Since it is spring I decided to purchase some stuff because I want to change my style a bit. I have been growing tired of my look and I felt the best way is to revamp my wardrobe. I also purchased a few makeup products that I have been dying to try. I bought a couple of things from ikatehouse, Charlotte Russe and H&M. Nicka K HD Concealer: I saw a youtuber haul this in one of her videos and she said that these are basically dupes for the La Girl Pro HD concealers. I have tried that concealer before and it is a fantastic concealer. When she said that the Nicka K concealer is better I just had to try it to see for myself. This concealer retails for $2 and it brings much more product than the LA Girl so it is a steal. I purchased two shades because the swatches on the website are terrible so I was not sure which was my shade but I picked the closest two. Hopefully, they will match. Angel Natural Lashes #73: I love the flair that false lashes can give to a look but I tend to rarely wear them except for special occasions because I am not a pro at applying them and they take me quite a while to apply so I do not wear them daily. 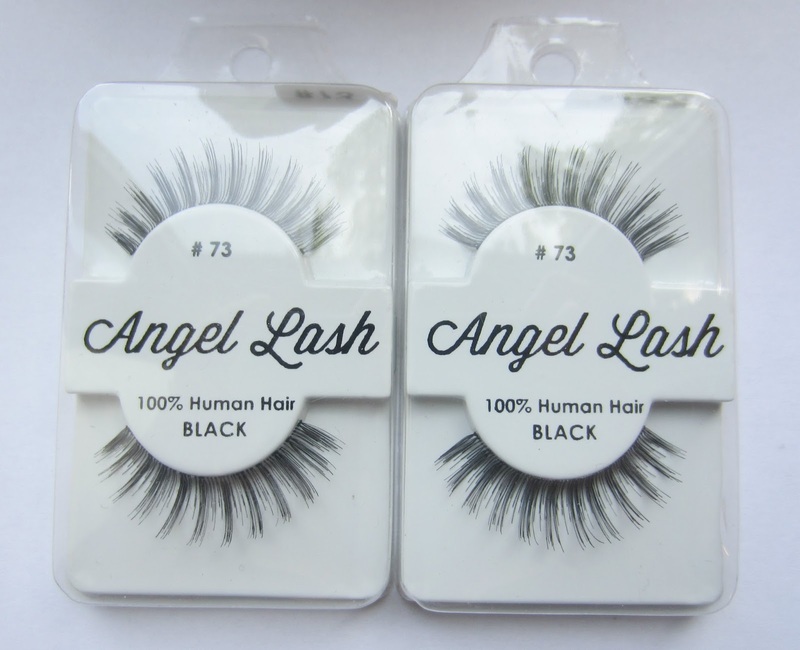 I love wispy lashes and they are basically all I ever wear when I wear falsies so I purchased these because they seemed different and I want to try out different styles of lashes. A pair of these lashes retails for $1.29 and I bought two. Bamboo Metal Plated Flat Sandals: I cleaned out most of my sandals in my wardrobe so I needed to buy new ones. As soon as I saw these I fell in love with them. 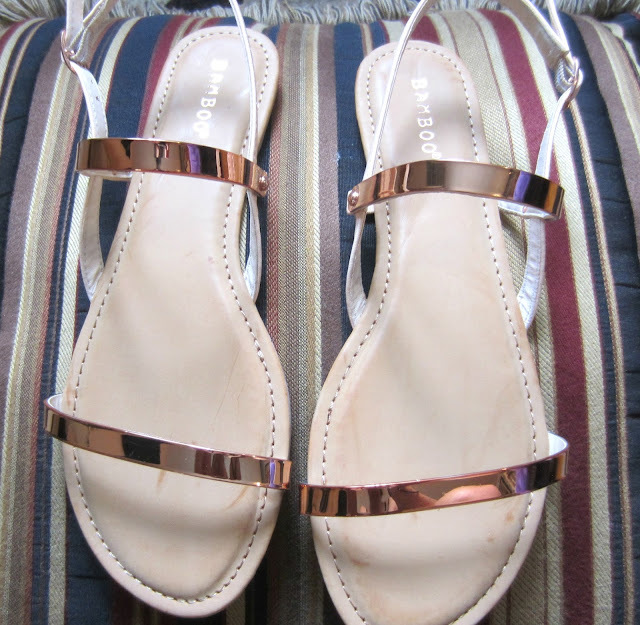 They are a lovely rose gold color which I am sure will complement my tan skin very well. I bought it when Charlotte Russe had a BOGO $5 shoe sale so I only paid $5 for these sandals. I'm so glad I purchased it because these sandals go out of stock in my size often. 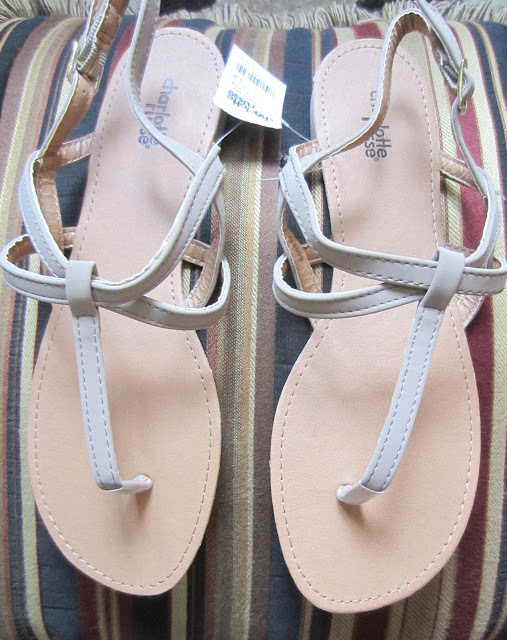 Taupe T-Strap Thong Flat Sandals: Yes, I know that thong sandals are so unfashionable and played-out but I bought these sandals because they are so casual and they will pair well with really casual outfits. Besides, they were only $15.99. Charlotte Russe has a good selection of shoes and definitely check them out because they have been having a lot of sales lately. H&M Slim Fit Pants: I want to revamp my wardrobe by wearing less black and experimenting more with color and prints. I wouldn't normally wear printed pants- but these pants caught my eye. The print is interesting and I love the combination of white and blue. These pants have a zipper on the side and beware these pants run very small. I normally wear a size 4 and a size 4 of these pants are super tight so go a size up. Shea Moisture is a skincare and haircare brand very popular for their organic skincare and haircare products. So much so that people wait until they are on sale at pharmacies such as Walgreens to stock up on them. I have heard so many great things about Shea Moisture that I decided to give their products a try to see if I like them and I picked up their Organic Coconut & Hibiscus Shea Butter Soap. They offer various types of soaps for different skin conditions. I chose this one because I wanted to see if this bar could help lighten my acne scars as it says "Skin Brightening". This is suitable for face and body and that is how I've been using it. It contains 3.5 oz and it lasted me a few months even though I've been using it for my face and body. This bar retails for about $4 and sometimes you can buy it on BOGO sales for less. This bar does not smell like coconut, in fact, it does not really have a noticeable scent. Since I love coconuts I was kind of disappointed. Face wise, I find that after I wash my face with this it can feel a little tight so I definitely have to moisturize after. Since its getting warmer and my skin is becoming oilier I have noticed that this is not an issue anymore. I have also noticed that my acne scars are somewhat fading but I am sure if it due to this soap or the fact that I have been exfoliating a little more often. 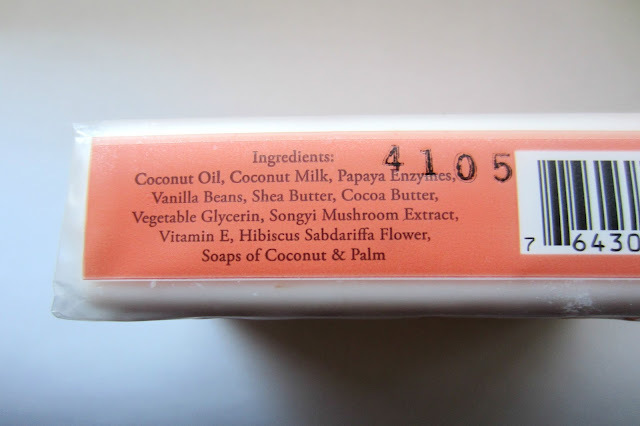 This soap did not let me down and I like the way it cleanses my skin. 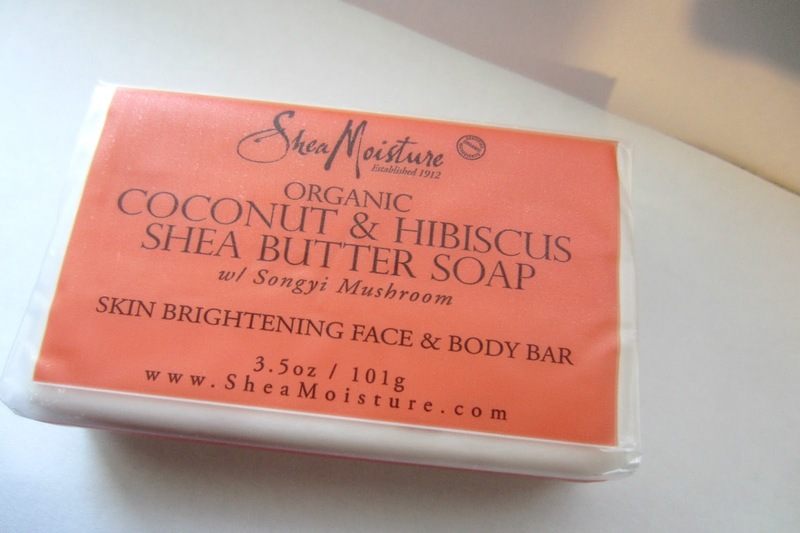 I totally want to try some more products from Shea Moisture- I have been eyeing a few of their bar soaps, body scrubs and the rest of the coconut skincare line. I purchased the African Black bar soap for my grandmother though as she suffers from bad eczema- hopefully it works for her. Have you tried Shea Moisture? What are your favorite products from the line? I purchased this cleaner at Target because I needed a product to temporarily fill the void that my much loved Parian Spirit brush cleaner left until I receive a new bottle in the mail. I like to spot clean my brushes frequently during the week because they'll be cleaner and therefore will not have a probability of causing breakouts. 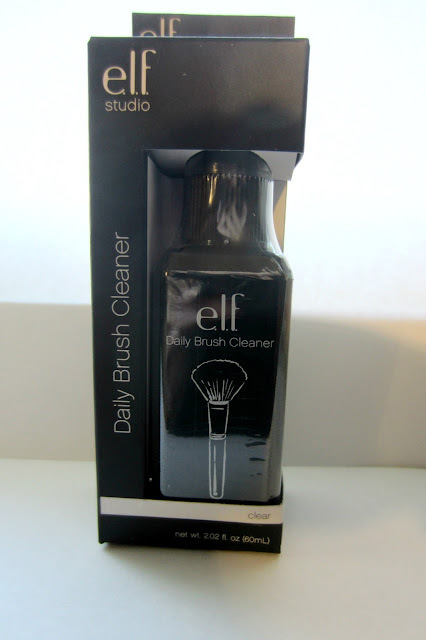 e.l.f states that this is an "anti-bacterial brush cleanser for cleansing in between makeup applications, disinfects brushes to give a fresh and clean application every time and helps to keep brushes lasting longer for extended use"
This retails for $3 and it can be purchased at Target, Walgreens and other stores that carry e.l.f. I really wanted to like this cleaner because of the price and I had high hopes that it would replace my Parian Spirit cleaner. Unfortunately, it shattered my hopes. This cleaner did nothing to clean my brushes, it was almost like water on my brushes. I tried it on blush brushes, eyeshadow brushes and foundation brushes but I sprayed the product on the brush and tried to rub the makeup off the brush- nothing happened. Just a tiny bit of product came off the brush. I became so annoyed that I ended up washing my brushes the traditional way with some dish soap and olive oil. I also do not like the scent; This cleaner has a faint scent of cucumbers and I do not like that smell. This cleaner does not live up to its claims at all and I'll stick to what I love the most. Maybe I got a bad batch? Like always, it feels like the month has flown by so fast and now its May. I'll admit, I went on a no buy for the month of April. It was not intentional- I just did not see any products that I liked which is so un-makeup addict of me. For the month of April, there were just a couple of new products that I found myself enjoying. 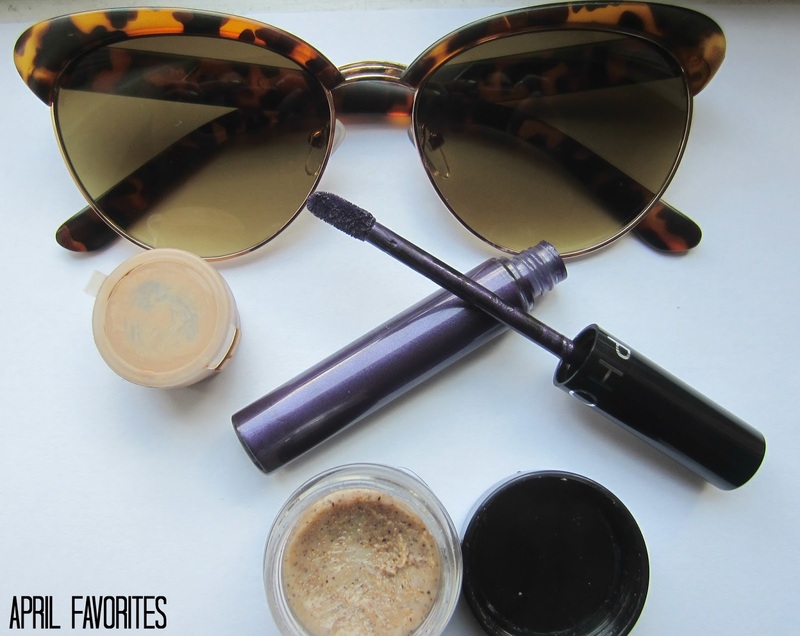 Most of the other makeup are products that I have already mentioned on the blog. NARS Sheer Glow Foundation: I picked up this sample thinking it was only going to be a single use sample but it has actually lasted me a long time. A little goes a long way because it has great coverage and looks amazing on the skin. I have had tons of compliments on my skin when I'm wearing it. 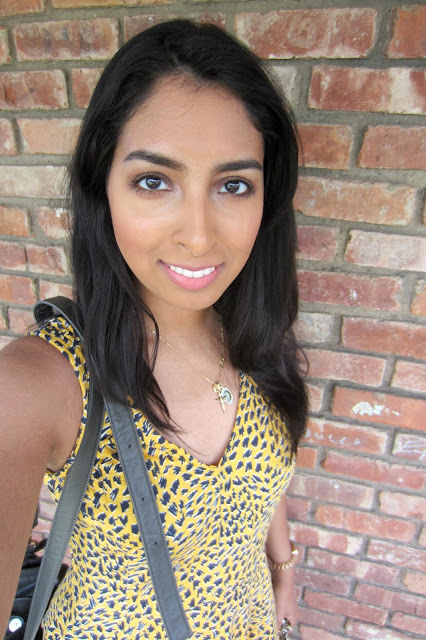 I love the dewy glow that it gives my skin- this foundation gives me so much life! I was afraid that it was going to break me out but that is not the case. I'm definitely going to buy the full size when I'm done with the sample. Forever 21 Love & Beauty Lip Scrub: I have used this plenty of times this month due to my Softlips cube fiasco that I received in Campus voxbox. This works well at removing the dead skin off of my lips and getting my lips ready for matte lipsticks. Sephora Collection Cream Lip Stain "Polished Purple": The Sephora Collection is seriously under-rated I realized this when I purchased this lipstain. I LOVE dark lippies so when I saw this shade I was immediately drawn to it. Polished Purple is a deep dark purple and it is beautiful! Super pigmented, matte yet creamy and does not dry out the lips. Well worth the $13. Last favorite for the month of April is my blog. I changed my blog name... AGAIN and I'm finally happy with it. I have also been playing around with my blog layout and I love the way it looks. I'm happy I was able to do this without having to purchase a blog layout although maybe in a couple months when I'm bored with this one I'll purchase one off of etsy. What are your April Favorites? Wet n Wild Max Volume Plus Mascara promises to give 10x volume while conditioning lashes. The cute packaging, its claims and a coupon led me to purchase this mascara to see if its claims are true. Wet n Wild Max Volume Plus Mascara is formulated with a jojoba, Macadamia Nut and Olive oils to condition and strengthen lashes. The mascara wand has short spiky plastic bristles. 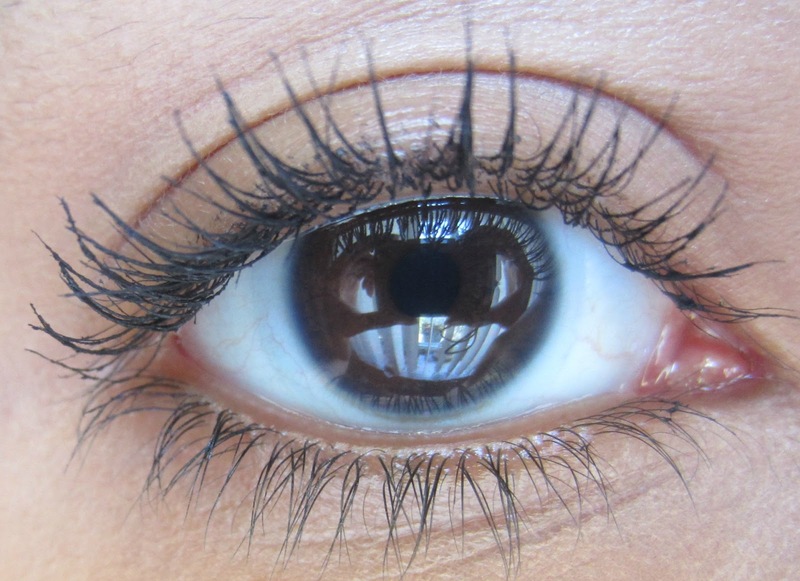 My lashes are not too short so most mascaras tend to work well with my lashes- I prefer mascaras with a dry formula. Overall, I don't like this mascara. 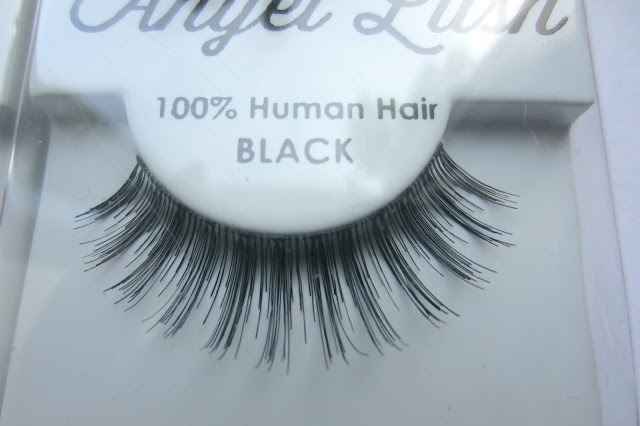 I have to apply it carefully because it can easily cause my lashes to clump together so while I'm applying I have to wiggle the brush between my lashes very well to separate my lashes. During the day I notice that my lashes just don't look as good as they did when I applied my mascara in the morning like my lashes lost its curl. I don't believe this mascara is worth it because all I'm left with is a clumpy look. I'm not too mad about this mascara being a flop as I paid only $3 for it. Wet n Wild Max Volume Plus Mascara retails for about $5. I think every blogger has reviewed this mascara and I'm probably the last one to do this but whatever. I kept seeing this mascara on ads and it seemed so promising so I had to give it a try as I had to replace my old mascara. Rimmel Wonder'Lash Mascara is formulated with Argan Oil to give full, smooth, clump-free lashes with a ultra-flex brush to apply mascara from root to tip. 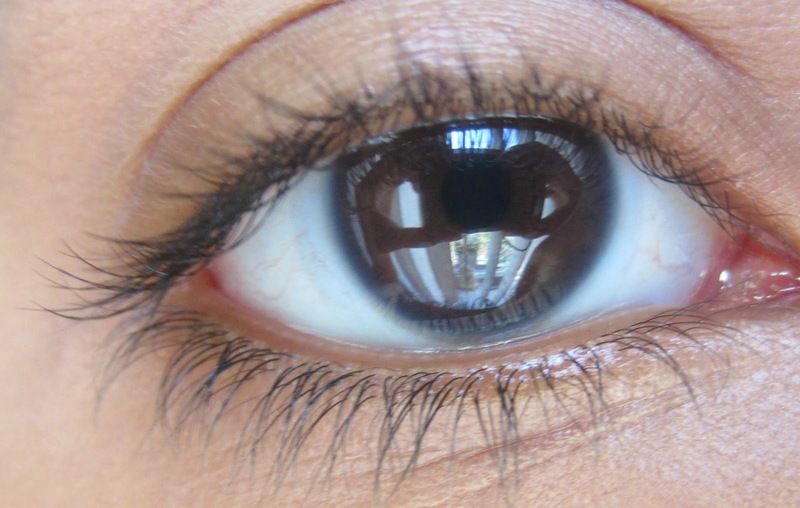 Argan oil has been very popular in the beauty scene for a few years due to its benefits so the fact that it contains this is also something that drew me to this mascara. I purchased it in shade '003 Extreme Black' at Harmon. 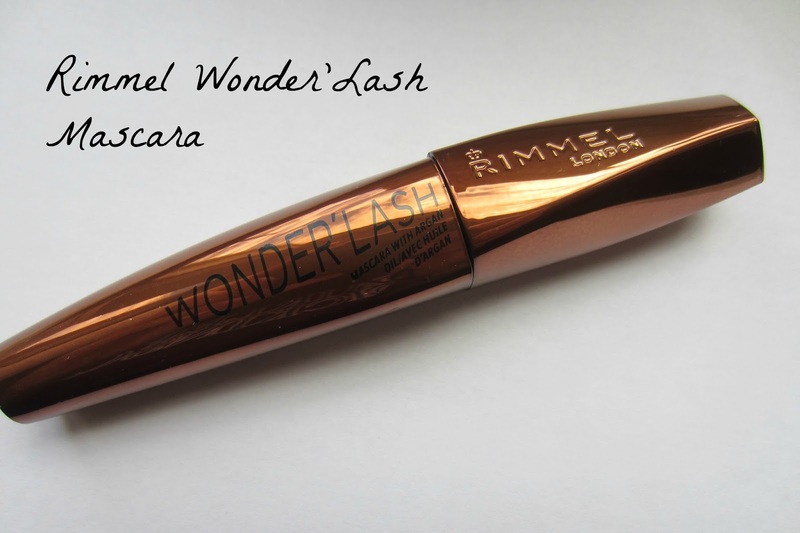 Rimmel Wonder'Lash Mascara retails for about $8. I adore this brush, it has a lot of evenly spaced plastic bristles that really helps separate and coat each lash with mascara. 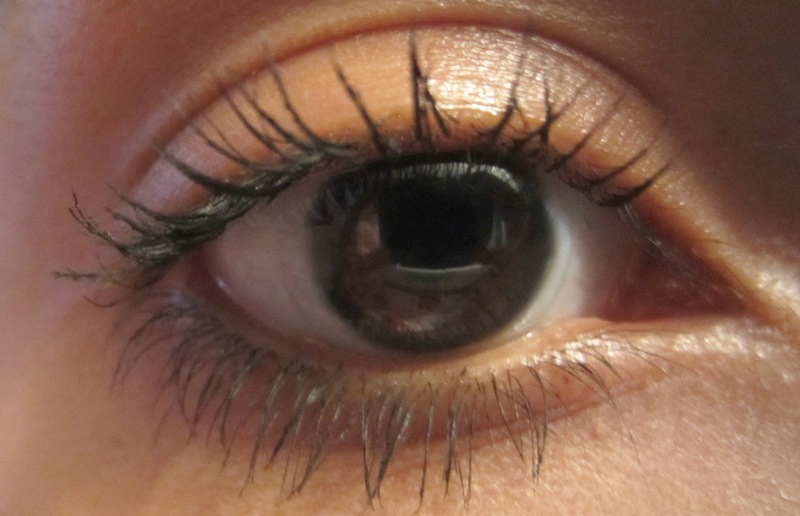 I find that this mascara gives my lashes volume and some length but it still looks natural and very little clumps. 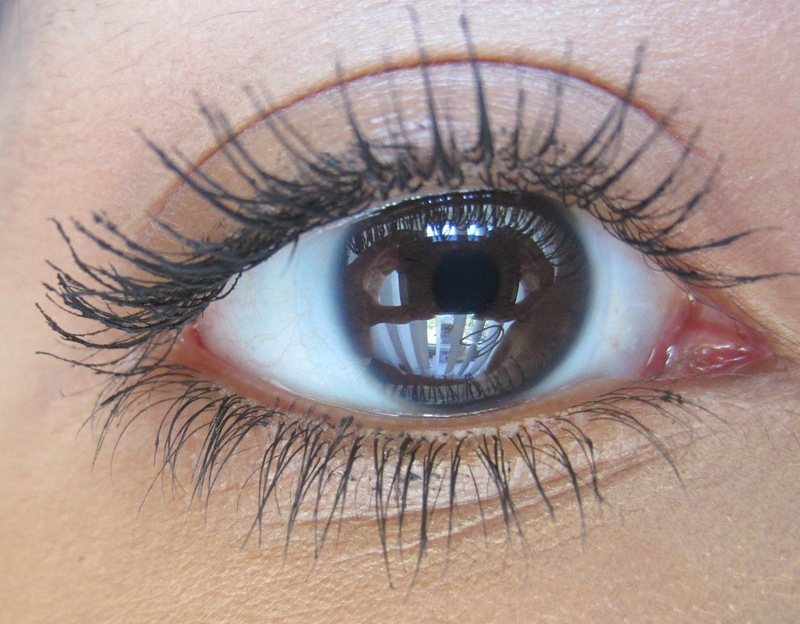 One coat of this mascara does the job and two coats will give the same look but with a little bit of clumps. Removal is very simple- it comes off easily with my eye makeup remover. I love the packaging, it really makes the mascara appear more expensive. 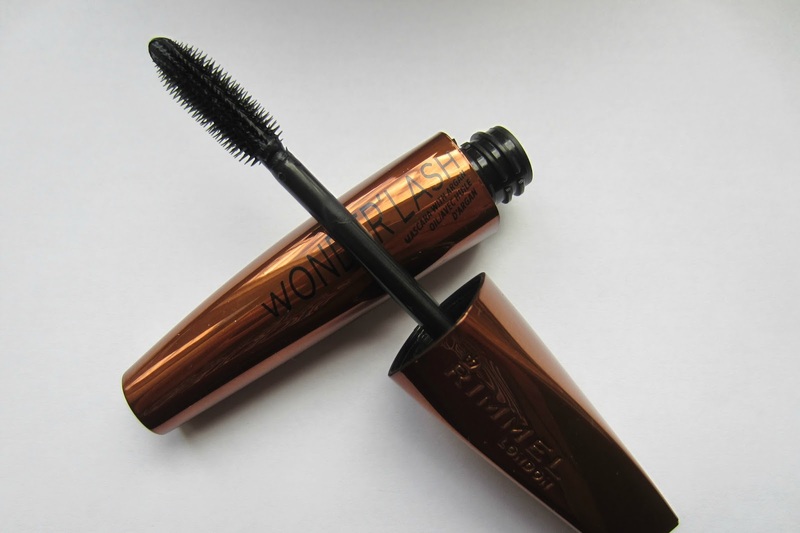 I'm impressed with this mascara and I believe Rimmel Wonder'Lash Mascara is great for those ladies who like a natural lash look.